We like games that will take a risk in both storytelling and gameplay. 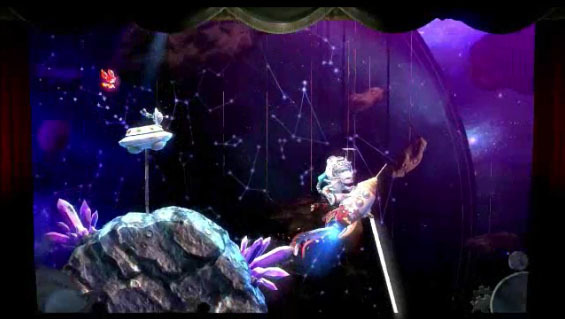 Puppeteer does both beautifully and changes how you may think about 2D platforming. The story centers on Cuttro a child that has been turned into a puppet by the Moon Bear King. The King has taken the Black Moonstone and smashed the White Moonstone and has given pieces of the stone to his evil generals. The Moon Witch Ezma Potts finds Cuttro frees him and helps him find the Magic Scissors and tells Cuttro if he ever wants to get back home he will have to find the Moonstone pieces and defeat the Moon Bear King. With the Magic Scissors Cuttro must free the souls that have been taken. Everything about this game takes chances. The 2D platforming has some tradition sections but most of platforming is different than anything we have ever played starting with the Magic Scissors. The scissors is equal parts weapon and means of travel. Many parts of the game require you to move across the screen but there is nothing to jump on to. For example, during a battle you need to climb to the top of a pirate ship. Here you don’t just jump up, you use the scissors to cut your way up the sail or across to the next point. It works perfectly every time and is always a little different for every situation. The game also does not have hit points you have different types of heads. You get to carry three different heads and each of them has a special power and can be used to unlock hidden areas if you have the right one. As long as you have a head you can take a hit. It is like Sonic where as long as you have a Golden Ring you can keep playing. We were never bored the whole time playing. 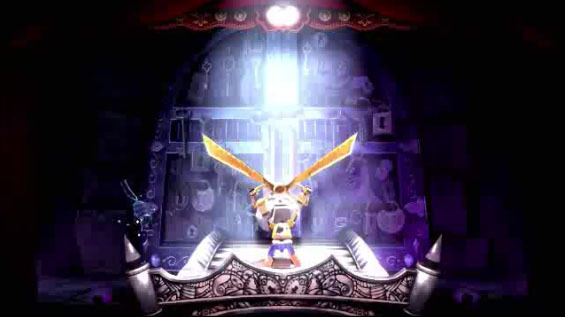 Puppeteer adds more power ups besides the scissors and finding different heads so each world, even each level has something new to do, this includes the boss battles. Each time you face one in combat you use the scissors in a different way and power ups change from boss to boss. There are a lot of different bosses to fight and some levels are quick and right to the point while others are an hour long marathon of you verses a giant evil General that you have to climb up to face them or even chop them down to size to finish them off. Boss battles you will want to replay over and over. Puppeteer took us between 10 and 12 hours to get through the first time. 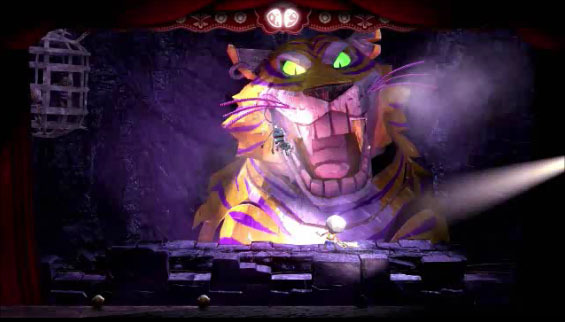 Puppeteer has some of the best unique art styles we have played. The whole thing is a puppet show where the audience reacts to what is going on. If you do something amazing the crowd will gasp and laugh when things happen. They will even get restless if you stand around too long and then start to shush the crowd when you start back up. 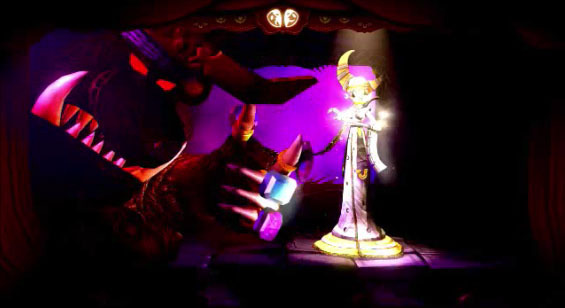 The entire game has a narrator that is interacting with the people on stage and the audience. Storyline is great from start to finish and the voice acting, controls and camera are perfect the entire game. 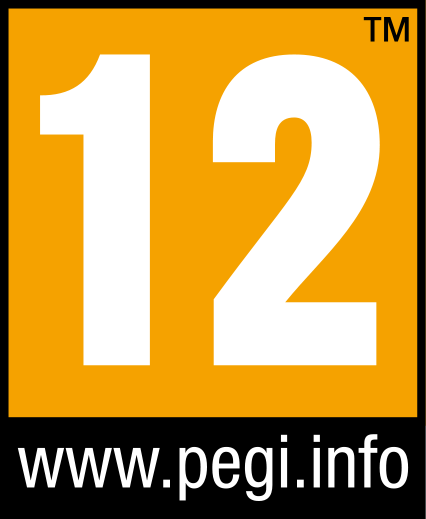 The problems are few but present in all 21 levels. There are no save points anywhere, if you start a level you have to finish it and some of them are close to an hour long and if you die the game takes you way to far back in the level. Not a big deal but we wish we could save somewhere in the middle of many of the levels. Great game and is one of the top 5 games for 2013 on the PS3 and now one of our favorite 2D platformers. Spend the money it is just that simple easily worth the $40.00 price tag.